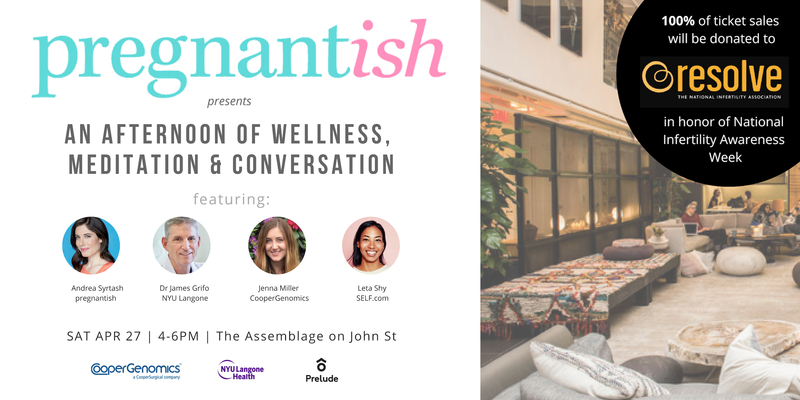 On Sunday afternoon April 27, join pregnantish at the Assemblage on John Street in NYC in honor of National Infertility Awareness Week, for an inspiring, supportive and insightful afternoon of meditation and conversation. Set your intention with one of the Assemblage’s healthy elixir drinks and sit down for a fertility-themed meditation before hearing from our esteemed panel on how to best navigate next steps with fertility, your relationships during infertility and how to address the many (many!) misconceptions. This conversation will be moderated by Self.com‘s Executive Editor, Leta Shy, and will feature Relationship Expert & Founder of pregnantish, Andrea Syrtash, Reproductive Endocrinologist Dr. James Grifo from NYU Langone Health Fertility Center and genetic counsellor Jenna Miller from CooperGenomics. Scroll down for more info on panelists. Whether you’re just starting or you’re many years into fertility treatments, our experts will answer questions on how to best manage this often stressful experience and maximize your success with it. During our meditation, we’ll also focus on setting an intention for ourselves, wherever we are in the process, so we feel more aligned with our goals. All participants will be treated to light bites and drinks, an educational panel and a special gift bag. Proceeds from ticket sales will go to RESOLVE: The National Infertility Association. Their National Infertility Awareness Week unites millions ofAmericans who want to remove the stigmas and barriers that stand in the way of building families. Pregnantish supports singles, couples, LGBTQ. All are welcome to join. This exclusive event, which has been generously supported by CooperGenomics, Prelude Fertility, and NYU Langone has limited capacity and will sell out. Get your tickets here. Andrea Syrtash is a Relationship Expert and the Founder of pregnantish.com, the first media site exclusively dedicated to helping singles, couples & LGBT navigate fertility treatments and infertility. A regular on-air personality, Andrea’s hosted television shows for Oprah’s OWN and Fox; and regularly appears as a guest expert on TV and radio shows across the country. She’s the author of popular books including, He’s Just Not Your Type (And That’s a Good Thing) and Cheat On Your Husband (With Your Husband). Andrea frequently speaks about how to improve relationships, most recently at the TEDx ‘Makers’ Conference. She is committed to breaking the taboo of infertility, and elevating the conversation about what it takes to start a family for millions of people today. Follow her @andreasyrtash. James A. Grifo, M.D., PhD is a world respected reproductive endocrinology and infertility surgeon, and a leader in fertility research and advancements, including in preimplantation genetic diagnosis (PGD), preimplantation genetic screening (PGS) and fertility preservation. In addition to serving as co-founder and Program Director for the NYU Langone Fertility Center, Dr. Grifo is also the Director of the Division of Reproductive Endocrinology and a Professor of Obstetrics and Gynecology at the NYU School of Medicine. Dr. Grifoalso serves as the Chief Medical Officer for Prelude Fertility, a network of top-tier fertility centers across the US offering comprehensive fertility care. In 1992, he performed the first embryo biopsy that resulted in a live birth in the U.S. A leader in egg freezing, Dr. Grifo’s research team produced the NYU Vitrification Method, which has been in use at the center since 2004. Jenna Miller, MS, LCGC is a board-certified and licensed genetic counselor. She holds a Bachelor of Science degree in Genetics and Biotechnology from Brigham Young University and a Master of Science degree in Human Genetics from Sarah Lawrence College. Jenna began her career at Recombine providing genetic counseling to patients and physicians. She then moved into clinical diagnostics, eventually leading CooperGenomics’ carrier screening clinical diagnostics team. Jenna recently became CooperGenomics’ first clinical science liaison. In this role, she travels North America educating healthcare providers about genomics and genomic testing. She is passionate about genomics education, informed consent, and ethical approaches to genomic testing. Jenna lives in New Jersey with her husband and three cats named Kevin, Linda, and Mr. Chunk. Leta is the digital director of SELF, where she oversees editorial and brand strategy. Leta joined the team in 2015 as executive editor, and has been integral in the brand’s record-breaking traffic, and video growth.